What’s the Best Budget Spotting Scope? Spotting scopes can get extremely expensive. The further you want to be able to zoom with clarity the higher the price. Models from manufacturers like Swarovski and Leupold can set you back thousands of dollars. When prices get to those levels you’re essentially paying pay for the quality of the glass and sometimes for the feature set of the scope. If you’re on a budget or you’re getting your first scope to test the water, you don’t want to shell out stacks of cash for it. You want something feature packed, good quality and with a wholesome price tag. Yes, you won’t be able to see as far and with as good quality and focus as with more expensive scopes, but for the majority of users wanting to hunt, target shoot or go birding there is no need to pay extreme amounts for an optic that gets the job done. With today’s economy there are a few manufacturers on the scene selling reasonable quality optics with all the expected features that really don’t cost the earth. We’ve listed a bunch of these below and after a little discussion on what makes a good budget scope we’ll take you through each one in more detail. Is a $2000 dollar scope really 20 times better than a $100 dollar scope? In order to answer that question you really need to define what ‘better’ means to you. Is it clarity, focus, field of view, eye relief, durability, water and fog proofing, or all of those features? If you’ve not owned many scopes and don’t really know what you’re looking at it’s very doubtful that you will be able to reap the benefits of a $2000 scope investment. A budget $100 dollar scope will do 60% of the job of a $2000 dollar scope and it won’t cost you anywhere near 60% of $2000 (that’s $1200 in case you were wondering!). Higher prices scopes with better quality will give you clearer, brighter and less distorted images at the highest zoom levels. But as you go further up the spotter scope price scale the returns on your investment diminish. For the majority of users… unless you’re going to be pushing a budget scope to its absolute limits all the time it will work just fine for you, and save you a load of spondoolicks. What do BAK4 and BAK7 mean? Does it matter at this price? You’ll see reference in specifications to the type of glass used in the prism of spotting scopes. BaK stands for BaritleichKron which is german for “Barium Crown”. In short, when you’re buying a budget optic, that specification is just a small piece of the whole puzzle that doesn’t tell you anything really about the quality of one optic to another. There are so many other quality factors to consider, that really you need to pick based on reviews of what you or others see through them. (p.s. that’s why we’ve written this article!). You’ll rarely find even a budget optic with anything less than fully multi-coated lenses inside. Fully multi-coated means that there are multiple layers of coating on all lens surfaces. A coating that is designed to help enhance the natural properties of the glass to transmit as much light as possible. Fully multi-coated is the best type of coating. Better than coated, fully coated or multi-coated. Again, that specification however is no testament to the number of layers of coating applied, and the quality of that process and indeed the actual type of coating. So don’t be misled. First off, you know what the numbers mean right? Very briefly a bigger objective size or aperture on a scope gives you (generally) a heavier and longer scope with higher zoom levels. Your choice of objective lens size should take into account how portable you want the scope to be and just how far you want to be able to see. When you’re choosing a budget scope you may need to limit your expectations as to just how clear and focused an image you will get at anything approaching full zoom. For starters 40x-60x zoom levels aren’t practical to use without some sort of tripod, if you don’t have a tripod all you’ll see is a large magnification of your hand shake. One of the things the budget scope market won’t give you is a long or a lifetime warranty on their products. In fact you’ll be lucky to get any warranty at all aside from the retailers or manufacturers guarantee that the product will work when you receive it. If you do get a manufacturers warranty, don’t be immediately sold, how easily can you actually claim against it and how good is customer service? Is there even a distributor in your country? Budget scopes… customer service levels may vary. Budget spotters simply aren’t going to have the same build quality as high-end scopes. 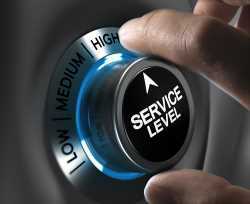 So you can’t expect the same guarantee and quality of service. Today’s budget products are designed to be used and when they break, you buy a new one. Everyone wants a durable scope. One that comes with a little bit of rubberized armor and helps protect against scuffs and the odd knock. Waterproofing and fog-proofing are pretty much also standard features even on low quality optics that have been purged with nitrogen gases and sealed (having no oxygen inside a scope means no fogging and protection against internal framework rust). What you need to remember here is that just how waterproof and durable are these optics going to be? Do they adhere to any standard? How strict is the factory quality control? Your milage is going to vary with a budget optic vs a mid-high level optic. So don’t expect something that you can use to climb the highest local peaks in a storm regularly without any sign of ever failing. One thing that many budget scope manufacturers have been doing recently is throwing in a host of nice little extras to make their scopes more attractive to the buyer. Soft and hard cases, tripods, scoping adapters, and cleaning cloths are all commonly found giveaways. The quality of these extras in our picks are going to be basically up-to the job. That’s not to say you won’t be able to find a better case or a better tripod out there with more features that’s easier to use, but the freebies are certainly nice to have. GoSky are a brand name on top of a generic ‘Made in China’ scope. You’ll see these exact same scopes listed on other sites with other brand names. This is a mass produced white-label product. But don’t let that put you off, a lot of budget stuff is sold like this. In terms of features this scope has fully multi-coated lenses, armor, waterproofing and fog-proofing. It’s an angled scope but the eyepiece can be rotated so you can easily use it looking skyward, or from a car window mount for example. The objective lens also has a retractable sun-shade. 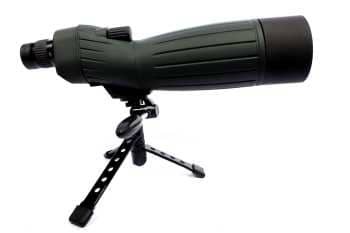 With good accessories, this scope seems to be aimed at the amateur birder or nature enthusiast as it comes with a small tripod, soft snug fitting case and cell-phone adapter for digiscoping. The usual lens caps and cleaning cloth are also supplied. The digiscoping phone adapter is a universal mount that has jaws to hold your phone and a thumbscrew to position it on the scope. This type of mount can be a little fiddly to use repeatedly and regularly as every time you attach the phone some minor adjustment is usually needed. But for basics and the odd photograph it works fine, we’d recommend a permanent swing away style adapter for more enthusiastic birding. Due to the large 80mm lens this weighs about 1200 grams, so isn’t the lightest or most compact of scopes but it does manage to give clear pictures of target holes at anywhere from 100 to 250 yards so great for target shooters and archers. You may struggle to get absolutely clear focus at the highest zoom levels but for most users this optic offers an exceptional price/performance point. If you see this scope listed with AE at the end of the name outside of what the other numbers mean the AE stands for ‘Angled Eyepiece’. That’s because this one is also available in an SE ‘Straight Eyepiece’ version for hunters and other users who prefer to sight in exactly the same direction as their target. As the Emarth is only a 60mm objective lens the weight and size of the scope is much reduced. This one only 600 or so grams to carry and 350 mm in length. Emarth include a table-top tripod with this scope and a carry case that includes a compartment to hold the tripod and keep it separate from the scope. Smaller and more portable this scope is designed for the trekker or hunter that wants to get out and about with it. With that in mind this one is also waterproof, fogproof and comes with the usual rubberized armor coating although it isn’t what we’d call ‘rugged’. If you want to target shoot at anything from say 200 – 300 yards and see the target holes clearly you may want to look at a larger more powerful scope, but for 100 yards and normal archery distances this will work fine. If you opt for the AE version, the angled scope, it’s worth noting that the eyepiece is fixed, no rotation. Not great for a car window mount. Emarth another generic ‘made in china’ scope brand but this little scope is a great piece of kit so don’t let that put you off. Barska is a name you may have heard of. They’re actually a brand with a decent website and a presence in the US. That’s something to bear in mind if you’re thinking about taking them up on the limited lifetime warranty offer this scope comes with. You’ll find their gear in many US outlets and sporting good stores. The Colorado scope is their entry level scope and is usually an absolute steal in terms of price if you’re only wanting to see clearly up-to 150 yards or so. Due to the exceptionally low price tag, not all the usual features can be found on this scope. It has fully coated lenses (not multi coated, just fully coated, so all surfaces exposed to air are coated, not internal surfaces and only once). It isn’t waterproof and isn’t fogproof. It does however have shock proof armor. There are rubberized strips down the sides of both sections of the scope which are designed to take the impact should you drop this from any height onto a hard surface. We didn’t actually try breaking one, but this type of armor would suit an outdoorsman.For long distance birding, shooting or hunting uses you’ll need to skip this one as even the manufacturers state that over 150 yards and you’re going to struggle to get a clear image. But this scope is an ideal choice for the short range target shooter, hunter or archer. Roxant are by no means a household name yet. They don’t have a large presence online or in the marketplace, but they do offer a small range of ‘cool’ products, this scope being one. With that lack of presence and company size also comes a seeming lack of warranty. You get lifetime support with this, not really sure what that is but it’s not a warranty by any stretch. As you’d expect this comes with a small table-top tripod, a case and lens caps. So an okay accessory package but nothing special. Where this scope excels is in the specification for the price. It has an adjustable eyepiece meaning you can extend or retract it to get your eyes correctly positioned if you’re a spectacle wearer. There’s an adjustable sun-shade on the end of the objective lens and the lens cap is attached to the scope so you won’t easily lose it. That’s a nice touch. Whilst this scope only has a small magnification range 12-36x and a relatively small objective lens 50mm it does however offer crisp and clear focused images all the way through that range and doesn’t advertise itself to be usable at zoom levels that it can’t handle. Great for all users, shooters and archers up-to say 150 yards or so and hunters, outdoorsmen and naturists who want something compact and light that gives clear images all the way through it’s zoom range.